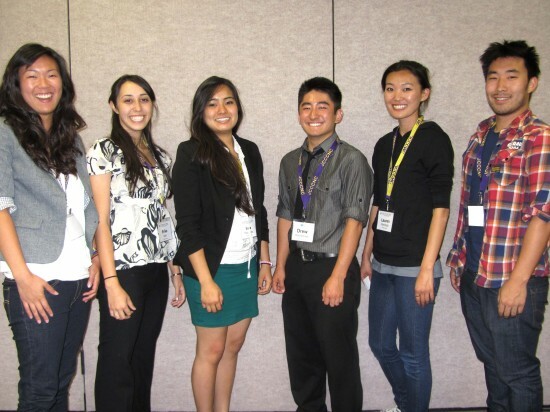 SAN FRANCISCO — The Japanese Cultural and Community Center of Northern California (JCCCNC) on June 27 introduced its six interns for the 2012-13 Nikkei Community Internship (NCI) Program and the Kase Nikkei Community Scholarship Program. These students have been selected based on their desire to become further involved in the community, preserve the Japanese American culture, improve community outreach and become future community leaders. Both programs offer college students opportunities to increase their understanding of contemporary social, cultural, civic and preservation issues affecting the community, and allow them to gain valuable skills in their individual areas of interest and grow both personally and professionally. Throughout their internship, they will take part in developing and implementing new programs and marketing strategies at the JCCCNC and participate in other activities at the center and around the community to help sustain the rich culture and traditions of the Nikkei heritage. • Casey Ikeda, who just graduated from the University of San Francisco with a degree in U.S. history, is interested in teaching, law and working in the non-profit sector. He joined the Kase Program to meet and connect with other young individuals that share his passion of helping the community and to gain hands-on experience working at a non-profit. “No other internship gives you as much training with non-profit work, not only with the organization that we are assigned, but also an opportunity to learn more about community-based organizations in Japantowns within the state,” he said. With energy, ideas, and hard work, Ikeda wants to re-energize the Yonsei generation about San Francisco’s Japantown and make sure the community thrives for many years to come. • Drew Mametsuka is a second-year student at San Jose State University, currently majoring in animation/illustration but thinking of changing to pre-nursing. Interested in community outreach, different forms of art, the outdoors, and sports, he applied to the Nikkei Community Internship program with intent to give back to the community. • Erika Geer is a fourth-year double-major in international relations and Japanese at UC Davis. Actively serving on the cabinet of UCD’s Japanese American Student Society (JASS), she enjoys creating various social events for the members as well as volunteering for the Sacramento JACL. Through her involvement with the Kase program, she hopes to learn the intricate details of how an idea from inception becomes an active program positively impacting the local community – a skill that she intends to apply to her role on the JASS Cabinet and in future work settings. She also looks forward to bettering her understanding of the needs of the Japanese and Japanese American community in the Bay Area. “I want to be integrated and networked; not only able to reach out to areas of the community that need [help], but also able to apply the resources and connections to address those needs,” she said. • Lauren Morimoto is a recent graduate from UC Irvine. Growing up, she was highly active in the Japanese American community, participating in the United Japanese Christian Church and multiple Asian summer camps as a camper and a counselor. However, through high school and college she felt as though she lost a sense of connection to her community. Striving to reconnect and give back to the Japanese American community, Morimoto hopes that the Kase Program will help her to reconnect with her roots and folks from different generations. • Miya Yung, a third-year student majoring in child and adolescent development at San Francisco State University, was introduced to the Japanese American community at a young age by her mother. She grew up in youth programs like the Shinzen USA basketball goodwill exchange program at the JCCCNC, playing 10 years for the S.F. Enchantees, and volunteering at Kimochi Home. From high school to college, she became more involved in other ethnic communities and now looks forward to returning to the Japanese American community. During her time in the Kase Program, she hopes to gain a bigger understanding of the issues currently facing the Nikkei community and help create new programs and activities to keep the community strong and engaged. • Sara Matsumoto is in her fourth year at San Francisco State University, majoring in business and marketing and minoring in Asian American studies. While growing up in Southern California, she participated in many Japanese American Buddhist programs; she is interested in non-profit organizations specifically focused on the Japanese American community and broadening her skills in public relations, program development and marketing. She joined the Kase Program in hopes to immerse herself in the community, allowing her to mix her professional interest with her personal interests. If you are interested in learning more about the Nikkei Community Internship Program or Kase Nikkei Community Scholarship Program, contact the JCCCNC at (415) 567- 5505 or visit www.jcccnc.org.